Excellent site! I am starting to get the hang of using volume to determine turning points, using the Tradeguider MT4 plugin. One excellent feature this has are the H-stops - stops based on volume and very useful for placing stops as the trend progresses. Once a bar closes beyond one of these H-stops, its a sign to look out for a change…or indeed a continuation, if price closes back in the trend direction. I hope this chart will explain. Also, I find the last highest volume spike, draw a line across the top and bottom and wait for price to close either above or below those lines. But, if that closure is right at a support or resistance level…beware, price could bounce back into the area between the high/low lines and may break out to the other side. As price reverses down on 4th Jan, the H-stops follow price nicely down. On the 6th price closes above the H-stop during the Asia session, indicating a possible direction change. Price is supported at the long H-stop towards noon, then makes its move up. H-stops following nicely as it goes up. Notice how I’ve drawn horizontal lines at H & L of big volume bars. 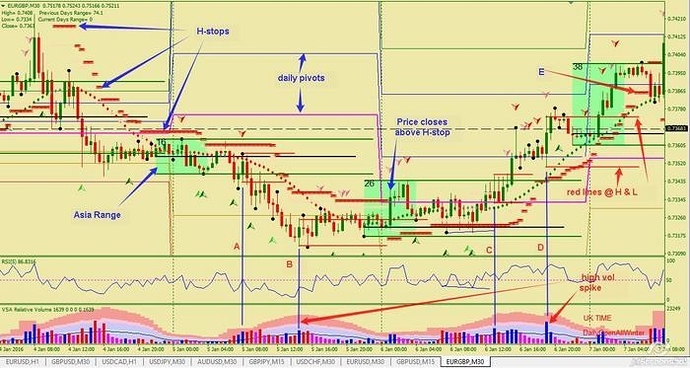 When price closes above or below these bars it USUALLY (no certainties in trading:-)) signals the direction of movement, with the opposite horizontal line as the stop. I hope this will help people with their trading. Hi blott, could you share the plugin with us ? Ahh…sorry , can’t do. It’s paid for information. I trade volume And fib but encorprate cot, open interest sometimes as well as big support/resistance ares.